Hornets eat leaves and tree sap but are also accomplished predators, feeding on flies, bees, and other insects. 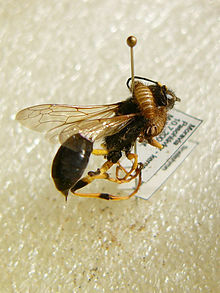 Hornets are wasps of the genusVespa, closely related to (and resembling) yellowjackets. There are about 20 hornet species. Most live in tropical Asia, but the insects are also found in Europe, Africa, and North America, where the European hornet was introduced by humans. These social insects construct hives by chewing wood into a papery construction pulp. They mature from egg to adult inside the community hive. Queens dominate hornet hives and are the only females to reproduce. Most other hornets are asexual female workers that perform essential community duties such as building the hive, gathering food, feeding the young, and protecting the colony. Males are few and they have only one real role—mating with the queen. Males typically die soon after their sexual task is complete. In colder climes, hornet nests are abandoned in winter and only new, young queens (and their eggs) survive the season by finding protected areas under tree bark or even inside human dwellings. In the spring, such a queen will begin a new nest, and soon her young will become workers and take over the chores of the new hive—leaving the queen to tend to reproduction. She will produce more workers to expand the hive and then, before she dies, yield a breeding generation of new queens and males (drones) to restart the cycle of life. These insects eat some tree sap but they are also accomplished predators. A hornet hive will eliminate many flies, bees, and other insects. Workers defend their hive with potent stingers. Though these insects do not sting humans unless provoked, some people are allergic to their venom and can have very dangerous reactions to a sting. Hornets are often considered pests, particularly when they nest near humans, because they will defend a nest aggressively if they feel it is threatened. Though many people fear their sting, hornets usually get the worst of such encounters when their nests are poisoned or destroyed. In some areas, such as Germany, they are granted protection to preserve their role in the ecosystem. Skunks are found all over Ontario, in forests and towns and cities. This highly adaptable animal is very common in many cities. Skunks discharge a bad smelling fluid to defend themselves from threats. A skunk is not an aggressive animal and will always try to retreat from a human. An angry skunk will growl or hiss, stamp its front feet rapidly, or even walk a short distance on its front feet with its tail high in the air. Before spraying, it usually humps its back and turns in a U-shaped position so that both the head and tail face the enemy. Skunks eat a wide variety of foods: insects, mice, shrews, squirrels, young rabbits, birds' eggs, and various plants. During the autumn and winter they eat about equal amounts of plant and animal foods, but eat mainly insects in the summer. The scent of the skunk is an effective defence against most natural enemies. Nevertheless, it is preyed upon by many large birds. In urban areas, skunks may spray pets or people that startle them. Skunks can cause damage to lawns and gardens. They may make homes inside buildings or under porches. Wild animals have the same basic needs as humans – food, water and shelter. Sometimes, humans and wild creatures come into conflict when animals are trying to meet their basic needs. Often, conflicts can be prevented if we're willing to make small changes to how we think and act. People and wild animals live side by side in Ontario. We all share responsibility for preventing and handling human-wildlife conflicts. If you must take action against wildlife, please consider all your options and follow all relevant laws and regulations. How Can I Prevent Conflicts? Feed pets inside and lock pet doors at night. To prevent skunks from digging up lawns for grubs, apply natural remedies from garden stores (microscopic worms called "nematodes" can be effective in killing grubs) or lay down one-inch mesh chicken wire. Store garbage indoors until collection day. Keep compost in containers that keep skunks out while allowing for ventilation. Block off potential access points to your garage and other buildings. Secure the perimeter of decks, sheds and crawl spaces. Complete home repairs in the autumn, so mother and young won't be trapped inside. Use flashing lights, motion sensors and noise makers to deter skunks. You may choose to let skunks occupy an area, such as under a deck, if they don't pose a problem. If you'd like to remove the animals, a wildlife control company can be hired. If a skunk gets into your house, stay calm. Close all but one outside door, and let the animal find its own way out. How Can I Handle a Conflict? If a person or pet is sprayed, the faster you clean up, the more completely you can remove the odour. If eyes get irritated, flush them liberally with cold water. Next, wash with mildly acidic substances such as carbolic soap, tomato juice, diluted vinegar, or the following home remedy: One litre of three per cent hydrogen peroxide solution 80 millilitres of baking soda and 5 millilitres of liquid soap. Always mix the solution in a large, open container. Use the entire mixture while it is still bubbling. Wearing rubber gloves, apply the solution, work it into lather, and leave it on for 30 minutes. After washing, follow with a long hot shower. You may have to repeat the process two or three times. When washing a dog, wash the body first and then the head to keep the dog from shaking off the mixture. Landowners may humanely kill or trap skunks that are damaging or about to damage their property. Firearm regulations and bylaws must be followed. You may also hire an agent to act on your behalf. • Speak with your neighbours, family, and friends. • Look for "animal control" in your phone book or online. • Call your local Ministry of Natural Resources office or the Natural Resources Information Centre at 1-800-667-1940. For information on how to prevent conflicts with skunks….